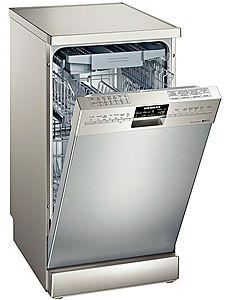 The dishwasher has become a common household appliance, but is also found in commercial settings. Some studies indicate dishwashers use less water than hand washing. Hot, soapy water is sprayed onto the load. Then, clean water rinses off the soap. The dishes are dried by a heating element. There are both freestanding and built-in models, some with changeable decorative face plates. Mini-dishwashers the size of an oven save space. Commercial units occupy more space, but can wash large loads quickly. There are front-loading, hooded and continuous-conveyor commercial models. Choice will depend on home versus commercial use, capacity, energy consumption and freestanding or under-counter installation. American machines carry Energy Star ratings, while the European Union uses the term Eco-label.